For those who use Google Photos, the web-based version of the service has received two much needed improvements. The first are keyboard shortcuts to commonly accessed features of the service. This is a big deal as it pulls Photos inline with virtually all of the other Google web-based services when it comes to quick ways to access features to the service. To see the new shortcuts, just type SHIFT+? on your Windows PC or Mac and you will get a pop-up that shows you the shortcuts available. 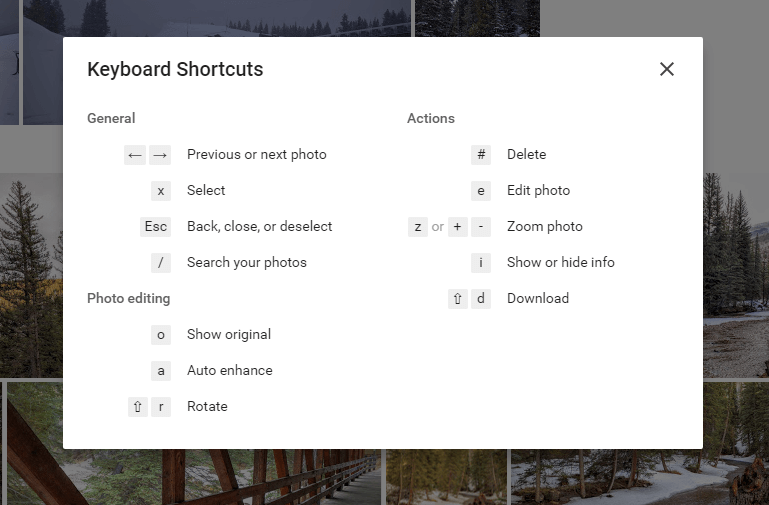 these shortcuts include the ability to quickly rotate photos, delete photos, select a photo, go into Edit mode for a photo and to auto enhance a photo. The second big change that came with this update is the ability to upload photos directly into albums from your PC or Mac. Previously you had to upload the photo then when it was completed, select which album to put these new uploads into in the service. No more. Now you can tell the service before you start uploading the photos which album to put them in, saving you time and effort in the process. These updates to Google Photos are all behind-the-scenes updates and are only on the web-based version of the service. There is nothing special you as a user need to do or any updates to do. It is now just a part of the service for you.